I like one pan wonder recipes. Especially when they use pantry items and don’t require a special trip out to the grocery store. Pasta Puttanesca is one of those dishes that can transform boring staples into something magnificent. It’s rustic approach, and combination of lively strong flavours is what it is best known for, although the debates over the origin of its name are far more entertaining: Diane Seed’s “whore’s spaghetti” or Sandro Petti’s “garbage/worthless pasta”? Which do you prefer? Okay, before I turn you off from making this pasta, let’s move along. My inspiration for this pasta came from the tube of anchovy paste sitting in my fridge. I had purchased it the week before to make Jamie Oliver’s version of the Perfect Caesar Salad. The anchovy paste brought me that much closer to perfect…trust me! My pantry was out of the essential capers and olives necessary for this recipe, so I had to make the obligatory grocery store run. 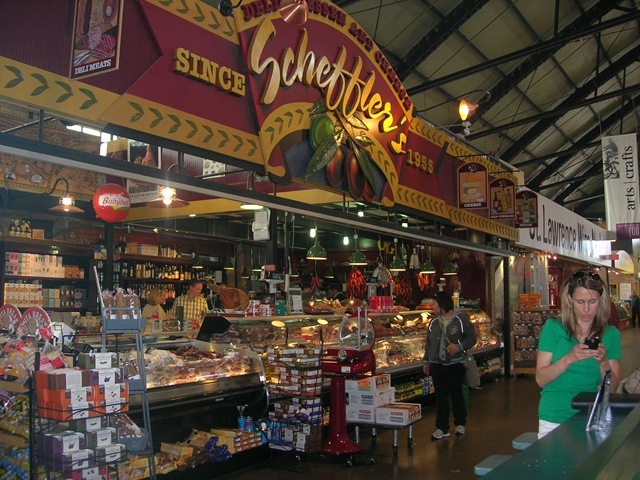 I happened to be in the area of the St. Lawrence market around that time and made my first ever visit to this food haven. I know what you’re thinking. 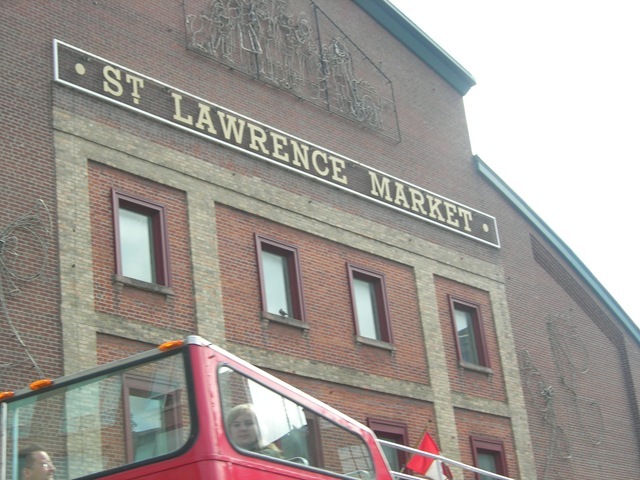 How could I have never visited the St. Lawrence market before? Well, it just happens that I haven’t. And while I took in all the sites, sounds, and smells I managed to pick up a large bunch of the most gorgeous basil, and a huge hunk of Parmigiano Reggiano. And within 10 minutes of arriving at home I got my meal on the table. 1) Bring water to the boil, salt, and add desired amount of pasta (single serving). Cook until al dente, while reserving a cup of cooking water. 2) In a pan, heat 3 tablespoons of olive oil. 3) Add 1 tablespoon of anchovy paste (or 3 anchovy fillets) and 3 cloves of minced garlic to the pan. 4) When garlic is golden add 1/4 cup of strained tomato sauce. 5) Pit 8 green olives. Roughly chop and add to pan. 6) Add 2 tablespoons of capers to pan. 7) Season sauce with crushed black pepper and a pinch of salt. Note: There is already a lot of salt in the olives, capers, and anchovy paste, so be careful. 8) Simmer sauce for 10 minutes. Adding pasta water to thin out if necessary. 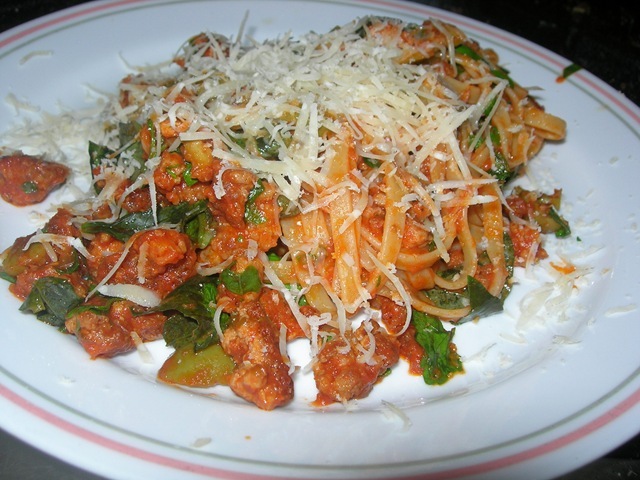 9) Add drained pasta to pan, and garnish with chopped parsley and lots of torn basil leaves. 10) Top with a generous grating of parmigiano reggiano and serve.